Kaine Felix, right, of Guiseley scores the added time winner against Nuneaton. Picture: Steve Riding. 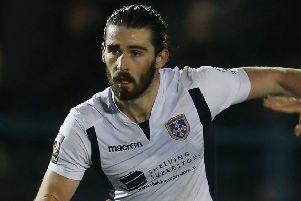 Guiseley scored a dramatic late goal to claim their first victory of the National North season – a 2-1 triumph over Nuneaton Borough. It had been over 300 days since the Lions had won on a Saturday, but they broke that run thanks to a 93rd-minute strike by Kaine Felix. Alex Purver, right, scores the equaliser for Guiseley against Nuneaton. Both sides entered this match looking for their first victory of the season, the hosts had a good chance five minutes in, when a ball over the top found striker Rowan Liburd who controlled the pass and shot, his effort though lacked power and Cam Belford saved. In a game of few chances, the visitors would take the lead with their first real opportunity as they broke forward with Dior Angus and Enoch Andoh countering and the duo combined with the latter finishing smartly. Nuneaton should have doubled their lead when a free-kick was nodded across goal to Danny Burns who saw his effort go over the bar. Guiseley equalised halfway through the second half, when Alex Purver collected a pass on the edge of the area and hit a fine effort into the bottom right-hand corner. It looked like the game would end in a draw but a long throw for the home side wasn’t cleared and Felix was in the right place to hit a low effort past several players and into the back of the net. There was further drama when Nuneaton’s captain Ash Carter was sent off just before the whistle was blown. After the match Guiseley’s joint manager Marcus Bignot said: “I’m delighted to get that first win, we had chances and deserved it. Elsewhere, Hull City and Huddersfield Town defender Sam Collins kicked off his reign as York City caretaker boss with a promising point at Brackley. Collins, who has declared his interest in the full-time position, secured a 0-0 draw at last season’s beaten National League North play-off finalists, who couldn’t even muster a second-half shot of any description. Exciting 18-year-old Fergus McAughtrie called home keeper Danny Lewis into the best save of the match, as his firm 25-yard effort was fingertipped behind for a corner, denying the former Sunderland academy player a goal on his senior debut. Bradford Park Avenue moved up to third in the table – with their fourth win in six matches – at much-fancied Hereford. Conor Branson gave the visitors a first-half lead after powerfully heading home a Nicky Wroe cross. That advantage was then doubled when sub Danny Boshell was tripped by Mike McGrath on 79 minutes for a penalty that Oli Johnson converted. The Bulls’ consolation also came from the spot with Harry White successful from 12 yards after Mark Ross tangled with Jamie Bird.